Monge heads into his final year with a championship on his mind. Photo Shaun Michaud. Born in El Salvador, the Stingers star moved to Canada when he was just a toddler. Monge and his family settled in Gatineau, Quebec, where he enjoyed most of his childhood memories. Inspired by the talents of his older cousins, it was at the age of eleven that Monge realized how much basketball would play an instrumental role in his life. Meticulously carving up defenses has been one of Monge’s many strengths on the basketball court. Making his debut for the Stingers in the 2014-2015 season, Monge averaged 29.2 minutes per game, second only to former all star teammate Ken Beaulieu—the dunking machine—who was played 29.6 minutes. After Recently signing a pro deal in France, Beaulieu had kind words to say about his former teammate and friend. “Me and Rick had each others backs on the court no matter what. The player he’s become today is a testament to his hard work and relentless work ethic,” he said. Monge never shied away from pressure or hard work, even when he was a freshman. That year, he also led the team in free throw percentage at just under 80 per cent (33/42). Over and above his dedication to perfecting his craft on the court, the 6 foot floor general took care of business in the classroom as well. Monge initially pursued a double major in Finance at John Molson School of Business. He explains that his grandmother had a big impact on his decision to attend business school. More to this, Monge’s upbringing accentuated his good performance at school. The Stinger says his father instilled in him the value of education—never to be taken for granted—since he was a young boy, so having good grades was second nature. It was all he knew. Monge’s third season in the maroon and gold culminated right before everybody’s eyes. His shot transcended to the 3 point line as he understood how to dictate the speed and intensity of the game. 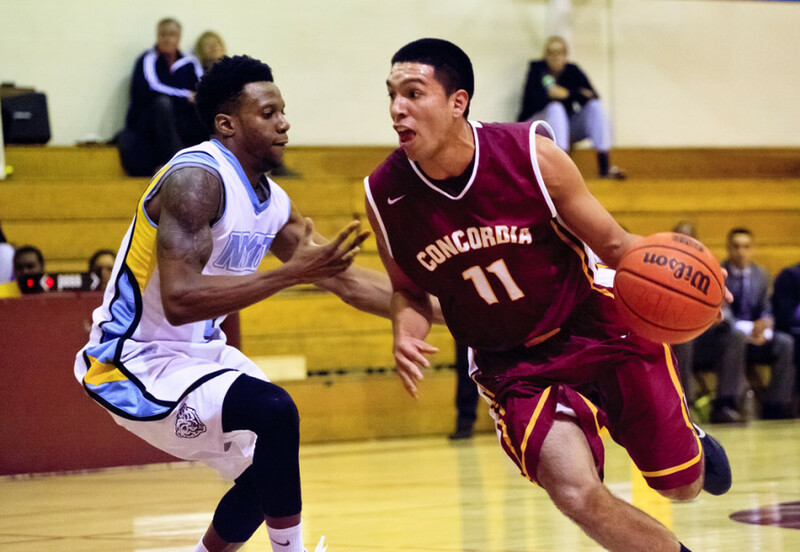 Monge knocked down 17 three pointers and dished out 50 assists as a junior, both team highs. Last year, the captain’s shooting continued to flourish. He made a total of 24 three pointers. Despite this, throughout the 2017-2018 campaign, the grind of being a student athlete took a toll on him. Head Coach Rastko Popovic shares the same opinion as Beaulieu as he firmly stands behind his star point guard defining him as a leader, an individual who embodies the status of an elite-student athlete. “Ricardo represents our university with great pride. He is constantly leading by example and with an outstanding work ethic and commitment to being the best he can be, I believe the man deserves a lot of credit,” he said. In what he thought would be his final year at Concordia, Monge dropped his double major in accounting, made it a minor and began to study for the Chartered Financial Analyst exam in January 2018. Meanwhile, the team battled all season long, making it all the way to the finals against Mcgill. Despite the season ending loss to their rivals, Monge says basketball brought him back one more year to complete a Masters even though he graduated last June. “The drive to win is the reason I do everything. If it wasn’t for basketball, I wouldn’t be doing a Masters right now,” he says. Coach Popovic believes that with Monge at the helm, the team will benefit and have the right mentality approaching this upcoming season. The elite student-athlete will have the opportunity to cement his legacy at Concordia—A masters of Finance, a CFA and the ultimate prize of a championship title—but he is aware that everything starts in practice.